Lawrence Legend Enterprises was formed in July of 1989 by Lawrence David Ryan with Lawrence making his first public appearance with the stage name Lawrence Legend. 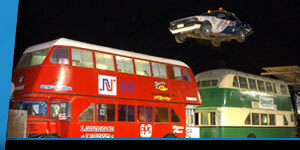 Lawrence Legend Enterprises has performed stunts for T.V shows commercials and live stunt shows. 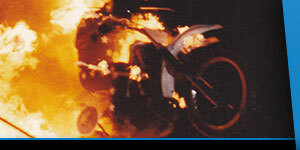 The main form of stunts for Lawrence Legend Enterprises is motorcycle stunts for Agricultural shows (Fairs) through out Australia for the past 20 years with no accidents involving the public or property and no insurance claims. Lawrence started performing stunts from the age of 14 years and now has over 20+ years experience in all forms of stunt work from car to bike, high falls to body burns, stunt coordinator to safety advisor, stunt trainer to school safety talks. Lawrence holds a pyrotechnics license and has held it for over 20 years. Lawrence Legend Enterprises has appeared on live T.V shows in magazines, international T.V and countless newspapers and books. Lawrence Legend Enterprises carries a $10,000,000.00 public liability insurance year round. All ramps, roll cages, stunt rigging and stunt design is all done in house at Lawrence Legend Enterprises, with over 20 years experience. Lawrence has worked for 3 years with professional driving teams as a team member plus worked as defense driving instructor for many years. We have worked on several T.V commercials and advised for others. 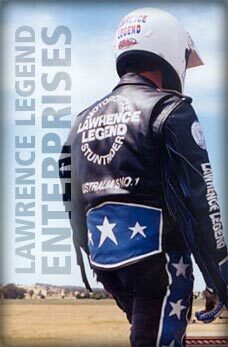 Lawrence Legend has created and performed more stunts then any other Australian stuntrider alive or dead. Lawrence hold’s more world records and Australian records then any Australian jumper ever. Lawrence has the largest collection of stunt memorabilia in Australia including the last remanding “Wall of Death” and “Globe of Death” in the country. Lawrence has performed all over Australia from Perth to Sydney to Darwin to Melbourne, Rockhapton to Mt Gambier and every where in between.